Bob, where is Desolation Row? Bob Dylan: Where? Oh, that’s someplace in Mexico. It’s across the border. It’s noted for it’s coke factory. Coca-Cola machines are… sells -… sell a lotta Coca-Cola down there. written those songs “in the spirit,” you know? Like “Desolation Row” – I was just thinkin’ about that the other night. There’s no logical way that you can arrive at lyrics like that. I don’t know how it was done. KL: It just came to you? BD: It just came out through me. pose. Desolation Row” is an anthem; it proclaims and forever defines a certain place, certain state of being… ..And finally I can say about “Desolation Row” only that I am in awe of it. in disturbingly unfamiliar scenarios, revealing a series of increasingly disturbing canvases. Being Dylan, he unravels no ordinary tale. Part of the inspiration (and title) might also have come from Steinbeck’s Cannery Row (an early Dylan enthusiasm), and some of it was almost surely derived from Kerouac’s Desolation Angels. But as with Juarez, the New York that the narrator has gone back to for this final song is a city of the mind, one that encompasses all of Dylan’s Highway 61 and the terrain surrounding it, a funhouse America that is everywhere and nowhere. @#9 on my list of Bob Dylan’s top 200 songs. 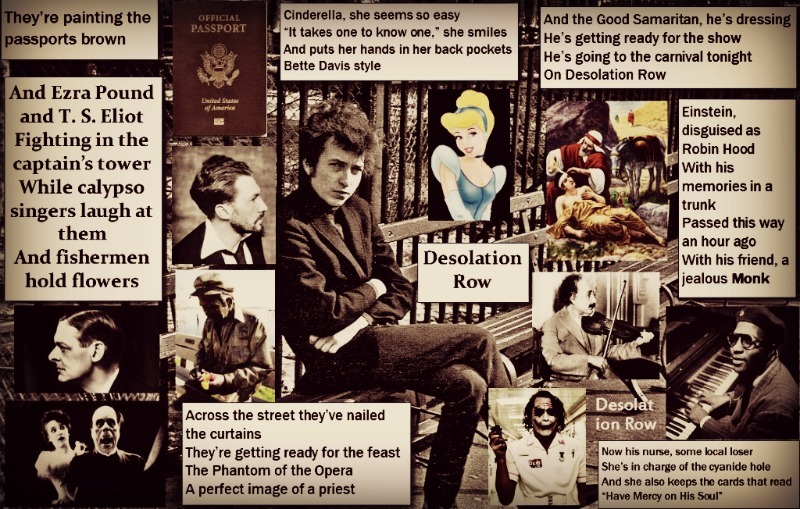 “Desolation Row” is a 1965 song written and sung by Bob Dylan. 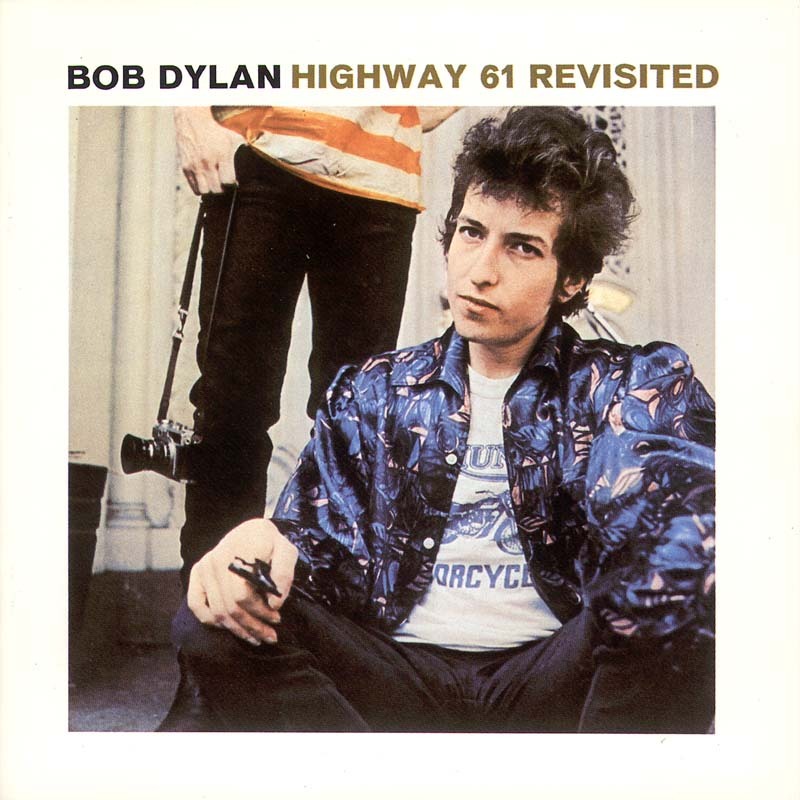 It was recorded on August 4, 1965 and released as the closing track of Dylan’s sixth studio album, Highway 61 Revisited. It has been noted for its length (11:21) and surreal lyrics in which Dylan weaves characters from history, fiction, the Bible and his own invention into a series of vignettes that suggest entropy and urban chaos. Studio A, New York City, July 29, 1965—1 take. Released on The Bootleg Series Vol 7. No Direction Home: The Soundtrack Columbia Legacy CD 520358 2, 30 August 2005. Released on Highway 61 Revisited Columbia CL–2389, CS–9189, 30 August 1965. So at the end of another extraordinarily productive session on August 2, he cut the song acoustically, allowing producer Bob Johnston to overdub some flamenco guitar fills (which may or may not have been provided by Bloomfield or Charlie McCoy) at a session two days later, before editing together the released version from four incomplete takes and the only complete take. There is still a fair amount of confusion, in various writings about “Desolation Row,” over who played second guitar, with some claiming Bloomfield and others Bruce Langhorne. Bob Johnston and Al Kooper are clear on this point, as is the guitarist himself, as are the album credits, as is the playing style: it was Charlie McCoy, end of debate. 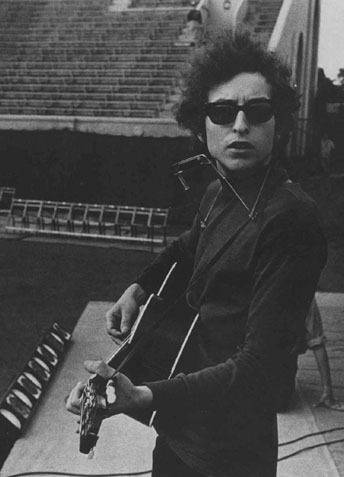 First known performance: Forest Hills, NY, August 28, 1965. It has been performed ~440 times live – last performance: Kirjurinluoto Arena, Pori, Finland – 17 July 2014. And Desolation Row? That’s a minstrel song through and through. I saw some ragtag minstrel show in blackface at the carnivals when I was growing up, and it had an effect on me, just as much as seeing the lady with four legs. He has remained pretty loyal to the original lyrics, only minor variations has occurred. Only thing off course is that the full ten verse original are long gone, he usually gives us 5-8 verses. “Desolation Row” is the soundtrack to an imaginary western, with its sepia tones, flimsy prop saloons, and corpses in the dust. Dylan was a fan of such westerns in his youth, a watcher of shows like Wagon Train, Rawhide, and Gunsmoke (whose sheriff Matt Dillon is a more likely inspiration for the famous name change than Dylan Thomas). Their sadness is one that reaches through the years, into the deepest, smallest, most frightened core of the self, where one’s fears, hopes, and anxiety live. In “Desolation Row,” Dylan dredges up all the haunting visions and ghosts of childhood and adulthood, the monsters that ones lived in his closet and now populated his dreams. By setting it to a musical motif so rich in resonance for those who, like him, grew up with the cowboy myths, he found a sound to match his night terrors, and it can send chills up the spine.”Laredo was a sinister town,” Kerouac wrote in On The Road. “It was the bottom of the dregs of America where all the heavy villains sink, where disoriented people have to go to be near a specific elsewhere they can slip into unnoticed.” This is the Wild West from which “Desolation Row” is fashioned. In the end, this is where Highway 61 leads. Here are a selection of live versions of “Desolation Row”. “sheriff Matt Dillon is a more likely inspiration for the famous name change than Dylan Thomas” interesting.